Tell the world what you do to make it a better place by wearing this totally unique t-shirt by STAY VOCAL. 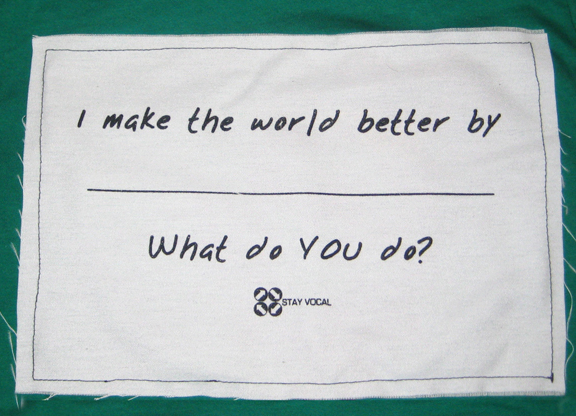 Each of these tees is emblazoned with a patch that says, I make the world better by _______ what do you do? The fill-in-the-blank design is for you to tell everyone what you are doing to make the world better. STAY VOCAL is a Green America certified ReUse apparel company. All of their tees come from either thrift stores finds, donations, or are brand new t-shirts that were going to be destroyed because of a misprint or over printing. STAY VOCAL also doesn’t just sell reused shirts. They reuse things in any step of the process. All of their orders are printed on the back of would be recycled paper, shipped in used packaging (mainly cereal boxes), with labels printed on scrap paper. Even their business cards are printed on used t-shirts and then cut out. Buy your What Do You Do? ReUse Patch Tee today from STAY VOCAL!